Citizens is a Minecraft server plugin that utilizes the Bukkit API. It adds various Non-Player Character (NPC) functionalities, from basic human NPCs to lively mob NPCs. Citizens also features an easy-to-use API for plugin developers to create new Characters. Support tickets: Issues on Github, but please see Troubleshooting first. Welcome to the Citizens Wiki! 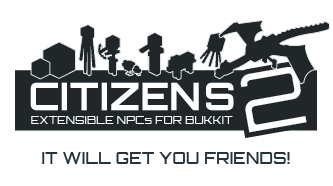 Citizens2 is an advanced NPC plugin for CraftBukkit. Unlike the original Citizens, Citizens2 allows developers to extend basic NPCs to provide varied gameplay and functionality. NPCs can walk, stand and talk naturally to players. Easy to use API for developers. This allows for brand new Traits that enhance your NPC experience. Monster and animal NPCs. You can create intimidating blazes around a Nether portal, welcoming sheep near the spawn, and helpful villagers in your villages. See the Commands page to see how to create a mob NPC. Robust text editing. The new text-editing interface allows for adding, removing, and editing NPC text. Player- and server-owned NPCS. Server-owned NPCs can be edited by anyone with the citizens.admin permission. Admins can optionally charge for NPC creation and limit the number of NPCs per player. Can I keep my NPCs from Citizens 1? You'll have to convert your old npc-profiles.yml files first. A converter can be found here. Once you get the saves.yml file, place it in ./plugins/Citizens/saves.yml . Still using Citizens 1.2? The old documentation, while no longer updated or supported, can be found here. The latest dev build for specific server versions are listed here. AgentK - Wiki editor, 1.x converter and script repo programmer. All character/trait authors, including those not mentioned here - talk to us on Discord! You, for trying out and using Citizens! Also, a special thanks to all of those on Discord who have tested and to all of those who have donated! We would be nowhere without you! This page was last modified on 26 February 2018, at 23:46.